1. The envelope. In featuring the 2016 membership card on the front, this one immediately makes it clear what’s inside and is firmly tied to the preceding email. 2. Impact sheet. Theirs is glossy, full color, and captured my attention. The sheet communicates to me what donor support has made possible during the year and reinforces the importance of continued support. 3. Insert. 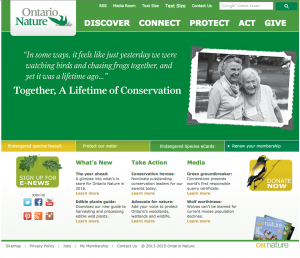 Phoebe and Gail, women who were reunited through their love of nature and participation in Ontario Nature’s mission, share their emotionally compelling stories that involve each other and their childhood friendship. 4. The letter. It introduces Phoebe and Gail and is very personalized to me, inviting me to participate in a conversation about what’s important to me. Their letter is so much more than an ask — it’s both inspirational and refreshing how much they want to hear my voice and value my feedback! 5. Reply device. ON knows who their audience is, and this contains large type for older eyes. This contains renewal gift options AND the opportunity for donors to engage further by participating in the aforementioned conversation. The handwritten notes add to the personalization factor of the entire package. One of the notes gently encourages an upgraded gift. 6. Website. ON continues with this year’s membership theme on their home page slider. What are my overall thoughts on this highly anticipated package? This was so worth waiting for! I was inspired, charmed, and delighted by the story of Phoebe and Gail, as well as their respective stories and their pictures. As a unified whole, this package really tells me what membership in ON means. It conveys the importance of nature and the wonderful work that ON does, as well as why giving to them today is so imperative. I think ON has been successful from start to finish, from the initial email, to the renewal package, to the ultimate donations I, and no doubt many others, will be making. 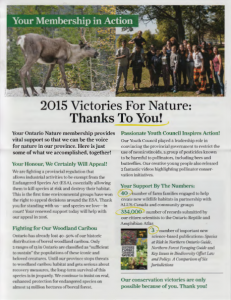 Thanks for sharing the Ontario Nature piece Pamela! If anyone wants to see the full creative for this pack – please feel free to email me at john@agentsofgood.org. Such an exquisite package, John. Thank you! Next post: What’s in my Inbox | The Soi Dog Foundation is a star — and so is this email!